31st Tamil Nadu State U – 13 Open & Girls Chess Championship being organized by Coimbatore DCA on behalf of the TNSCA commenced with a flying start after the inaugural function on Tuesday 1st of May, 2018. Dr. Nalla G Palanisamy, the Chairman and Founder of N.G.P Institutions, was the Chief Guest of the ceremony. Mr. Vijayaraghavan IA, Secretary of Coimbatore DCA delivered the vote of thanks. This 9 round Swiss System, Classical format, FIDE Rated, U – 13 State Championship embraced a record breaking 465 players from almost all the districts of Tamil Nadu. 5 days of enthusiasm and enjoyment were experienced by all the promising players. 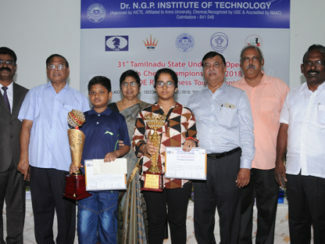 Master N. Vignesh from Kanchipuram has clinched the title in Open section and in girls section miss R. Mohana from Kanchipuram has clinched the title. The Prize distribution ceremony took place on 5th of May, 2018, Mr. P Stephen Balasamy, General Secretary of Tamil Nadu State Chess Association was the guest of honour who delivered the special address. Principal of Dr. N.G.P Institute of Technology Dr. Porkumaran also addressed the gathering. 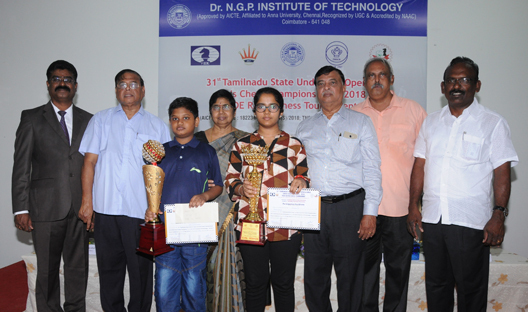 Prizes were distributed by the Chief Guest Dr. Thavamani D Palaniswami, the Secretary of Dr. N.G.P Institute of Technology.